Muhaimin Iskandar and César Rosselló at a press conference in Jakarta, displaying a document that welcomes PKB to full membership in CDI. They are flanked by Nahdlatul Ulama General Secretary and Presidential Advisor KH. Yahya Cholil Staquf (wearing a white shirt) and members of PKB’s Central Board. 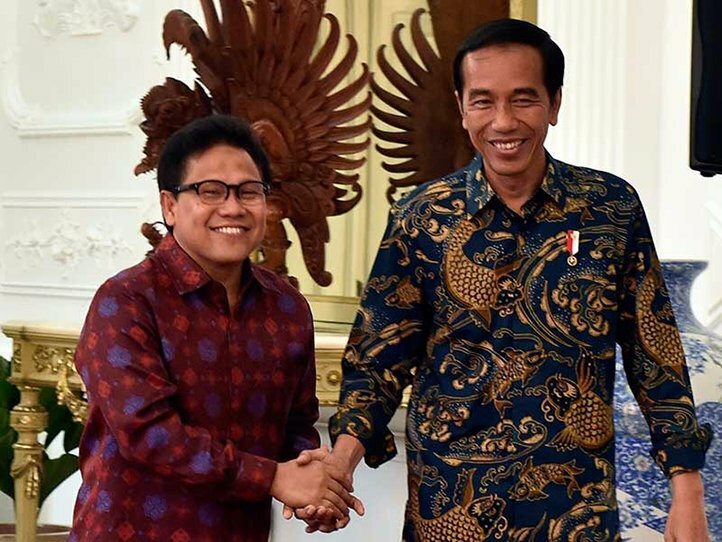 JAKARTA, Indonesia: On March 22, 2019, a delegation representing the world’s largest political network—Centrist Democrat International (CDI), with over 100 affiliated parties in more than 70 nations—visited Jakarta, where they met with the Central Board of Indonesia’s largest Islamic political party. 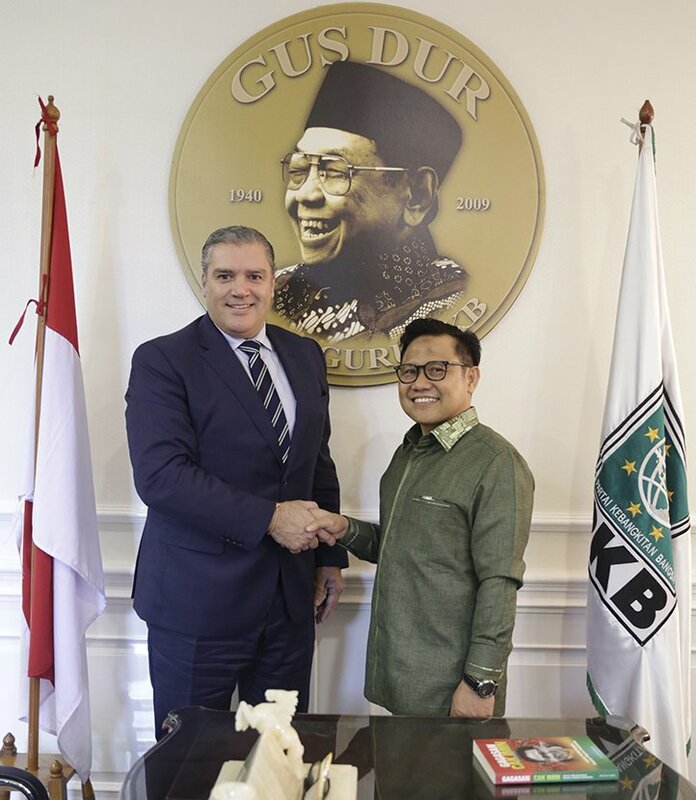 H. Muhaimin Iskandar, Chairman of the National Awakening Party (PKB) and Deputy Speaker of the People’s Consultative Assembly (MPR), greeted the delegation, headed by César Rosselló, CDI’s General Coordinator for Asia Pacific and Latin America. 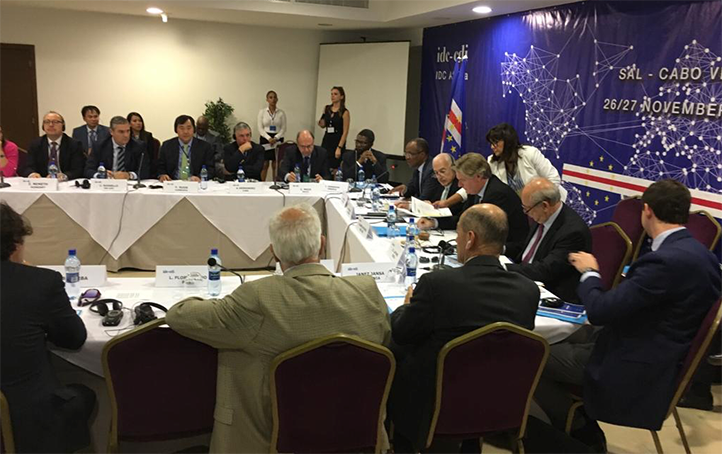 CDI—originally, an exclusive coalition of Christian Democrat parties—approved PKB’s accession unanimously and in record time at a meeting of its Executive Committee in Cape Verde on November 27, 2018. 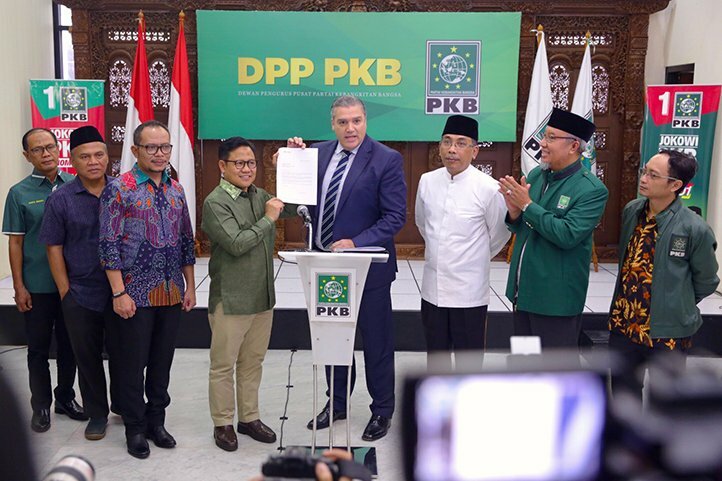 PKB, which serves as a vehicle for the realization of President Wahid’s vision domestically, is now moving to implement his vision of a pluralistic and tolerant Islam worldwide, in conjunction with the Nahdlatul Ulama and Gerakan Pemuda Ansor. KH. Yahya Cholil Staquf, General Secretary of the Nahdlatul Ulama, senior advisor to Indonesian President Joko Widodo and PKB’s Emissary to CDI, joined Muhaimin Iskandar in welcoming the delegation. Mr. Staquf remarked, “CDI’s European division, EPP, is currently the largest political party in Europe and includes many of its heads of government. Our engagement with CDI provides an unparalleled, multi-faith platform from which to deliver the message of Humanitarian Islam to a global audience, in order to ‘block the political weaponization of Islam and curtail the spread of communal hatred, by fostering the emergence of a truly just and harmonious world order, founded upon respect for the equal rights and dignity of every human being.’” Mr. Staquf was quoting the Nusantara Statement, adopted by the NU young adults movement, Gerakan Pemuda Ansor, on October 25, 2018. In recent years Mr. Staquf has emerged as a significant international figure, shaping public debate on issues related to Islamist extremism and terror. In January 2019, he addressed the European Parliament’s center-left and center-right political groupings—at the invitation of Portuguese Socialist Party MEP Ana Maria Gomes and the United Nations Interregional Crime and Justice Research Institute (UNICRI)—and spoke at the European People’s Party think tank, the Wilfried Martens Centre for European Studies. In December 2018, he addressed the Slovenian nation on the topics of “Migration, Terrorism and Freedom of Speech,” at the invitation of its former Prime Minister, Janez Jansa, who serves on the CDI Executive Committee. Interventions by Mr. Staquf helped shape public discourse amid the heat of Germany’s 2017 national election campaign and aided the Belgian government in stripping Saudi control of a Brussels terror mosque linked to Islamic State attacks in the Belgian capital as well as Paris. In 2017, the Rotating Presidency of the EU Council introduced policy recommendations by Mr. Staquf via the EU Council Terrorism Working Party to help reconcile severe policy differences—triggered by mass migration—that have strained relations between EU Member States in Western and Central Europe. The CDI Executive Committee unanimously approved accession of NU-backed Partai Kebangkitan Bangsa (PKB) in Cape Verde, on November 27, 2018. PKB’s accession provides it with direct access to the largest political network in Europe and the world: EPP (European Peoples’ Party) and Centrist Democrat International.